'Himalayan glaciers are expected to become smaller, and small glaciers will have disappeared, but by no means will all glaciers have melted by the end of the 21st century,' glaciologist Professor Markus Stoffel tells Rediff.com contributor Rashme Sehgal in Geneva. Glaciers are melting across the globe, including in the Alps and the Himalayas. This is a source of concern for glaciologists because the Himalayan glaciers feed the major rivers of the region like the Ganga, Brahmaputra and Indus. Professor Markus Stoffel, one of the world's leading glaciologists, currently works at the Climate Change and Climate Impacts Group at the University of Geneva and at the Institute of Geological Sciences at the University of Berne. A professor of geomorphology, the subject that deals with changes on the Earth's surface, Professor Stoffel is also assisting India's ministries of science and technology and environment to help train a team of young glaciologists take on the daunting task of studying the state of glaciers in the Hindukush-Karokaram-Himalaya belt. Professor Stoffel was recently awarded the Denali Achievement Award for his work on climate change impacts on mass movements (on the Earth's surface), at the annual meeting of the American Association of Geographers in April. 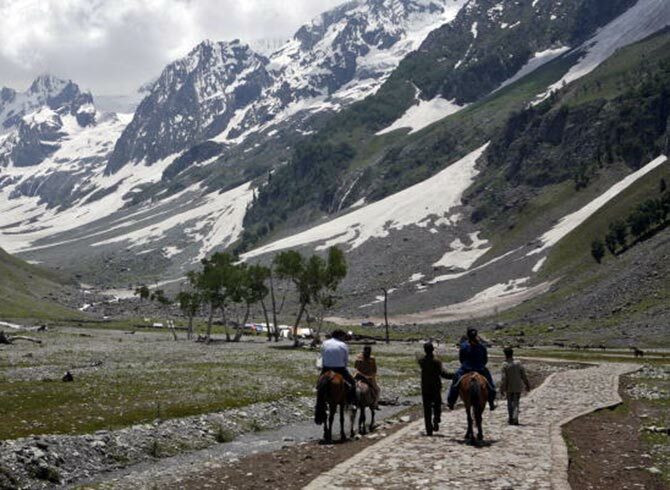 According to an International Centre for Integrated Mountain Development study, there are an estimated 54,000 individual glaciers in the Hindukush Himalayan region that are shrinking, thinning and retreating. How far is this figure accurate, given that there is very limited data available on the Himalayan glaciers? The ICIMOD studies you are referring to date back to 2004 and 2011, which means researchers have used satellite imagery that are even older than the years given in the report. You can assume that the images used in the first report date from the late 1990s and early 2000s. A plethora of work has been published since, among others a review paper in science (Bolch et al, 2012) where we updated the state and fate of Himalayan glaciers in 2012. The ICIMOD work as well as the Bolch study have used satellite imagery of different resolution to infer glacier numbers. The data can be considered accurate. The differences are due to different definitions of delimitations in terms of single glaciers, the boundaries of the Hindukush Himalayas and also because a retreating valley glacier can leave several smaller branches. Most Himalayan glaciers are losing mass at rates similar to glaciers elsewhere, except for emerging indications of stability or mass gain in the Karakoram. A poor understanding of the processes affecting them, combined with the diversity of climatic conditions and the extremes of the topographical relief within the region, make the projections speculative. Nevertheless, it is unlikely that dramatic changes in total runoff will occur soon, although continuing shrinking outside the Karakoram will increase the seasonality of runoff and also affect irrigation and hydropower. Are rising temperatures and sudden rainfall of greater intensity adding to the problem of retreating glaciers? It is difficult to attribute glacier retreat over the entire range to a specific cause. Rising temperature has been seen to contribute to glacier melting. Increasing amounts of precipitation can be beneficial (glacier mass gain) provided that precipitation falls during the cold season in the form of snow, but it can also be negative when it enhances glacier melt. It is a matter of timing and also depends on where you are within the range. The UN Environmental Data Explorer in a 2012 report also highlighted that lack of scientific data about the state of the Himalayan glaciers created uncertainty about the contribution of glacial melt to our Himalayan river basins. The livelihood of millions of people is dependent on the water of these rivers. How will this melt impact their lives? How do you see the situation unfolding in the years to come? The lack of in-situ data and longer term records is an issue. The impact of melting glaciers will depend on where the glacier is and on the time window we are looking at. In the very dry areas of Ladakh, for instance, less meltwater might have direct and severe impact on the livelihood of people. Several villages in the driest parts of the HKH are facing severe shortages of water even today, whereas runoff downstream of the Gangotri glacier is unlikely to change substantially over the course of the next few years. I see the major challenge is timescales of decades in most of the regions. But I also see a clear need to act now should meltwaters become scarcer and less regular. Why is it so important to know the mass-balance data of the 12,000 to 15,000 glaciers that form part of the Himalayan range? If we know the mass balance of a glacier, we can know how much it advances or retreats. We can also know the mass gained or lost in water equivalents and therefore estimate what changes we can expect in runoff (if we combine the analysis with snowpack, rainfall and evaporation data). Knowing how much ice we have in the HKH will allow us to quantify changes and to make estimates of what is left. How far is the figure of around 4,000 billion tonnes (Gt) of water being stored in these glaciers correct considering we have already lost around 443 Gt in the last four decades ? This figure is one of the estimates existing. Without a much larger number of monitored glaciers it seems difficult to know how good this (and other) estimate(s) is (are). These figures can give us an idea. The same holds true for the apparent loss. The take-home message in the figures you provide is that we have apparently lost 10 per cent of what was there some decades ago, and that we are at 90 per cent with respect to that reference period. It thus helps people to understand what is happening. How will the retreat of the glaciers impact our monsoons? You can also ask the question the other way round. How will the changing monsoon impact glaciers? Based on the data we have today, no solid answer can be given to either of the questions. Are you satisfied with the information available from satellite technology? How much of this is being supplemented by research on the ground? Satellite data is very crucial in remote areas. If I could have a wish, I would ask for much higher-resolved data that currently exist but cannot be accessed easily due to restrictions and their primary use by the military. In the absence of an extensive network of benchmark glaciers on the ground, satellites seem essential. How difficult is it to gain this scientific knowledge given that monitoring these glaciers is a difficult job? India is investing heavily in glacial research. Unfortunately we suffer from a severe shortage of trained glaciologists. Several Swiss experts including you are helping train and create a cadre of young glaciologists. What are some of the challenges you faced in training these glaciologists and what are the issues you are helping them to focus on? The capacity-building programme has been a great success story. The key challenge probably was to teach a very broad range of topic on glaciology and related fields within a relatively short time to young scientists from various backgrounds. We were, however, very much impressed how well the students did. I feel that each and every student who has finished the two levels has a very solid background to become a trained glaciologist. The major issue for them remains to be hired in a team or on a project where they can indeed go to 'their own' glacier at the end of the training. Swiss glaciologists are also working in Peru. How similar is the situation there as compared to the Himalayas? Glaciers are retreating in most regions of the world, and in many areas at comparable rates. Farmers in the mountains are facing problems which are not so different from those in the Himalayas, so the situation in both countries can be compared to some degree. Scientists monitoring the glaciers of Himachal Pradesh report a change in the snowfall pattern. How will this impact us? Changes in snowfall patterns can affect the duration of snowpack and thus the timing of snowmelt, it can lead to winter floods, droughts or forest fires before the arrival of the monsoon, drier fields, but also unseasonal snowfalls. Again it is a matter of where you are within the region you are looking at. The glaciers in the Alps are also retreating. What steps are being taken to reverse this? You cannot prevent glaciers from melting. In some tourist resort where glaciers are used for skiing, they will be covered locally to reduce mass losses. But this is only cosmetic. At a larger scale, research tries to predict changes in runoff so as to adapt to forthcoming changes. Climate change is now upon us. Scientists inform us that by the end of this century, the Himalayan glaciers will have melted. What alternate source of water will we have then? This is simply not true. Himalayan glaciers will melt, but they will still exist by the end of the 21st century. They are expected to be smaller, and small glaciers will have disappeared, but by no means will all glaciers have melted by this time. Water from snowmelt and precipitation will become more important, however, the runoff from some of the glacierised areas will have diminished substantially, that's for sure.